Take a trip back in time by riding Iola's Trolley named Fearless Fred. All trips are historic tours except those who rent the trolley for personal use. Iola's Fearless FredTrolley is reminiscent of the early 1900's when Iola had an electric trolley that carried workers, primarily, to and from the factories, but citizens rode it often, too. 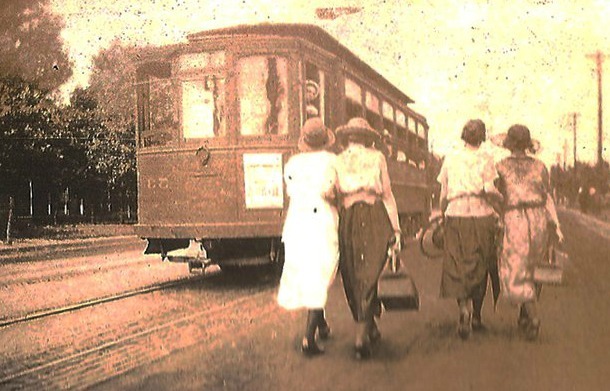 The electric trolley's ended before 1920 and were forgotten until 2007 w hen the Iola Chamber of Commerce bought Molly Trolley from Atchison, Kansas. After 10 years, Molly had had it! The Trolley Board sold Molly and found Fearless Fred from a trolley fleet company in North Carolina. Coincidentally, the owners of this trolley company are relatives of Iola's own Major General Fredrick Funston! It was just meant to be! Trolley Fred is busy giving historic tours from April to December with a special Christmas tours in late November and December. During the year the trolley is often rented out for weddings, family reunions, birthdays and class reunions. The Iola Trolley Board, under the umbrella of the Iola Chamber, offers historic trolley tours of old homes in Iola, 100 year old churches, cemetery tours, Iola historic tours, WPA tours and Elm Creek tours tours, just to name a few! Fred also offers historic tours of surrounding towns such as; Moran, Humboldt, Yates Center, Piqua, Colony and Chanute. You may also see Fred in many of the area small town parades! Call the Iola Chamber if you are interested in renting the trolley or want a listing of the scheduled tours for this season. No matter what the age, everyone loves to ride Fearless Fred the Trolley! Call the Chamber to reserve your seats at 620.365.5252.